All the salvage accumulating in our cellar comes infested with nails. Lots and lots of freaking nails. It seems that no job was too small for a 3-inch nail; nor, it seems, were nails in short supply: better secure that little strip of trim with as many (gigantic) nails as humanly possible. So yes, 9 billionty nails pulled, or approximately a little less than half of the pile. Anyway, while I was toiling way with the stupid nails in the cellar, the hubs was surprising me with a new (old) light fixture. 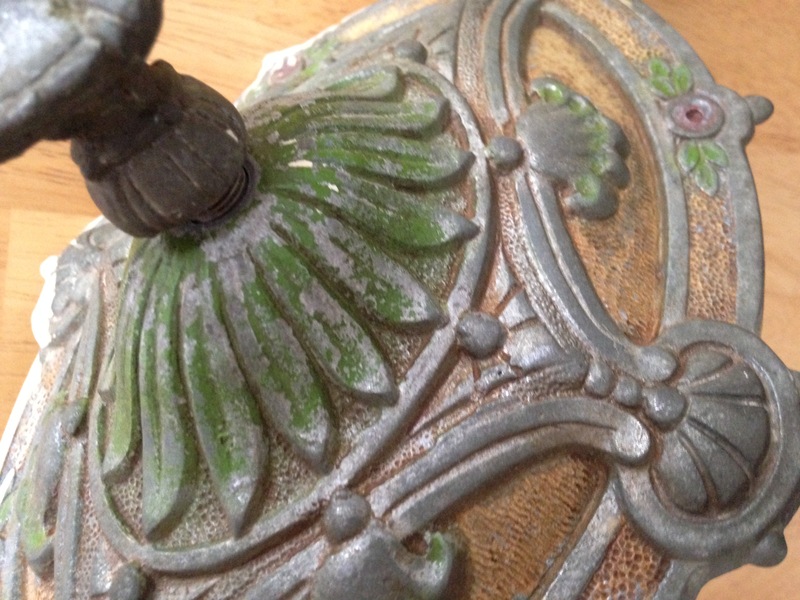 This purdy little thing was a salvage find from a couple of years ago, on a trip to Detroit. It was in need of a good cleaning and some new sockets and wires. I like the subtle hints of green, gold and red, so I think we’ll keep it like this (rather than restore to full color). However, as you might have noticed in some of the photos, at some point someone was less than neat with their ceiling pant job and got a big slop of institutional beige on the side (beige, the color of boring). 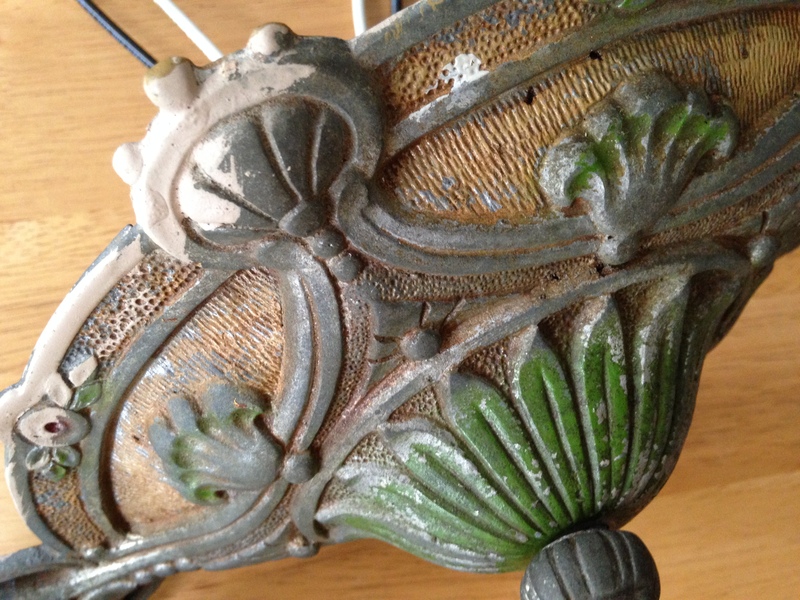 As someone who is fascinated with all manners of paint removal, I’m stumped by this one: how am I going to remove the ugly and keep the pretty? I have a few ideas for removing that sloppy ceiling paint. You could us some focused steam (a wallpaper/clothes steamer with smaller tube attachment) to soften the paint and then scrape/wire brush it away. 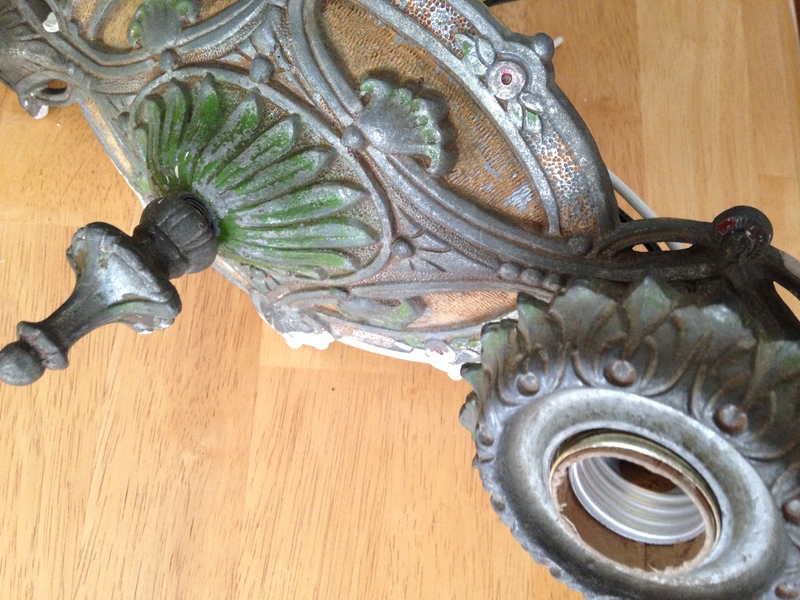 You could use a stripper gently applied to just that part of the light, then scrape the paint away and finish it off with a little steel wool to clean up any nooks. Either way, the fixture is awesome. Thanks! I’m going to give it a try with the steamer. 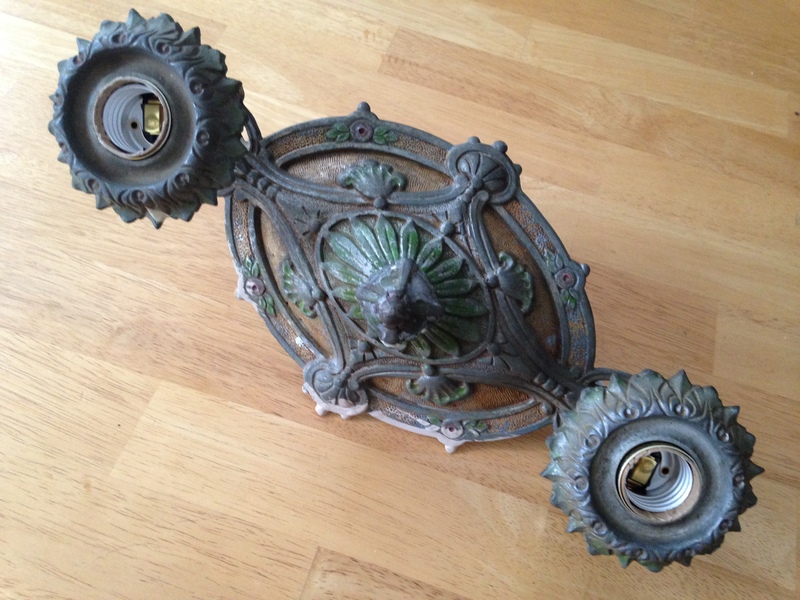 We have a few more fixtures that are similar, but this is the only with that has the annoying paint splotch.